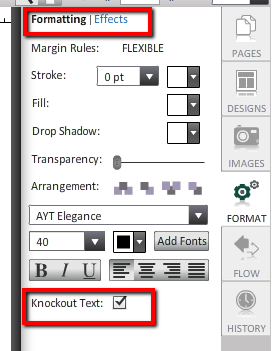 Knockout (outlined) Text Create an outline of your text with any of our fonts while making the font transparent. With Knockout text, you have a whole new layer of cool. Use any solid font, change the color and size...and then knock it out. Your solid font turns into an outline, and the text inside that outline becomes transparent. Knockout text cannot be used at the same time with other items like Glow and Drop Shadow. In Page Designer, click the Format button and select the Formatting tab. With the text object selected, mark the checkbox next to Knockout Text. This toggles the knockout text on and off. 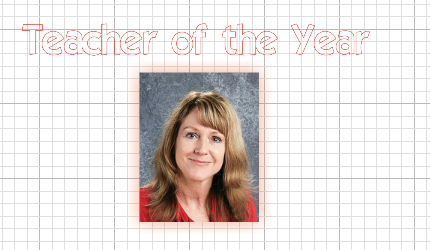 TIP: Create your own Headlines and Banners using shapes, knockout text, and grouping - OR make it a Click N Go.